Also known as 2D and Cartoon. Hand-drawn animation is perhaps the best known form of animation, having been championed by Disney since the 1930's. It is a sequence of drawings that, when filmed, give the impression of movement. Although drawn animation is perhaps the trickiest to master, there are many benefits in the classroom or group situation. Because much of the work takes place away from the camera, a lot of people can be working simultaneously, and their work can be brought, in turn, to the rostrum for testing & filming. You will require lightboxes for this, but these are comparatively easy to make. 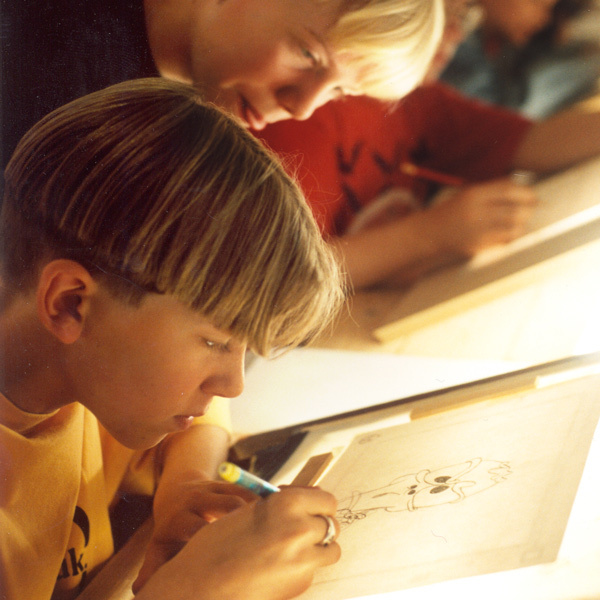 Your lightbox helps you 'trace' successive drawings from previous ones. Each drawing will differ slightly (and occasionally significantly) from the previous drawing, and, when filmed in order, the differences show up as movement. Between the 'key' drawings - which show a character's key poses - are the 'inbetweens', which show the intermediate positions. The use of these inbetweens produce a smoother movement or help slow a sequence down. Young people often create their drawings in chronological order; and for beginners this is the easiest way to see how progressive small changes show up as animated movement. However, with older children, encourage them to grasp how 'key' frames can be drawn first, and then inbetweens added later to flesh-out the sequence. Insist each drawing is numbered as it is created, to keep things in the right order. This helps if you test a sequence a number of times, and it also helps to reorder drawings, and put things back together if sheets get dropped. To make it easy to generate inbetweens it's good to number all drawings with odd numbers 1,3,5,7 etc. Then if you need to slow the sequence down you can start by creating the even numbers. If you need more inbetweens add 'a's and 'b's - or children may prefer to create 1.5 and a 2.5 and a 3.5 etc. If a shot needs a little bit more at its start, then you can make a few drawings backward from the first drawing. -1, -3, -5, etc. 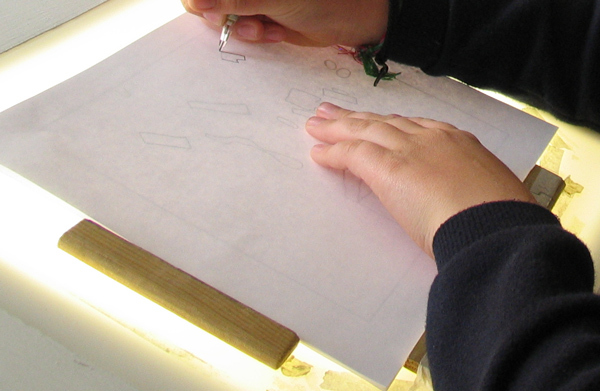 A lightbox is a flat translucent surface with a light behind it and a method for 'registering' your paper, to make sure each sheet is drawn and filmed in the right place. You can buy one, or you might find some available in your photography department. 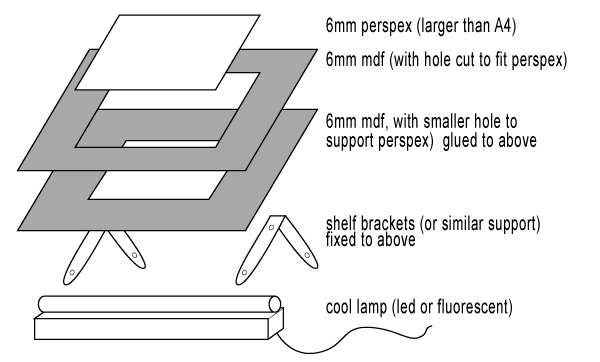 However making your own lightbox and registration system is fairly simple. There are many ways this design can be improved; but the advantage of this over a solid box is these are stackable. It is essential to keep your paper in exactly the same place when you are tracing and when you are filming. This is called correct 'registration'. Registration problems can usually be spotted when watching back animation because things that are supposed to be staying still are jiggling around; with wild animation it is difficult to spot registration problems - and it usually matters less anyway!